I got a bit of a late start with the October recipes, but with this post I am catching back up with two in one week. 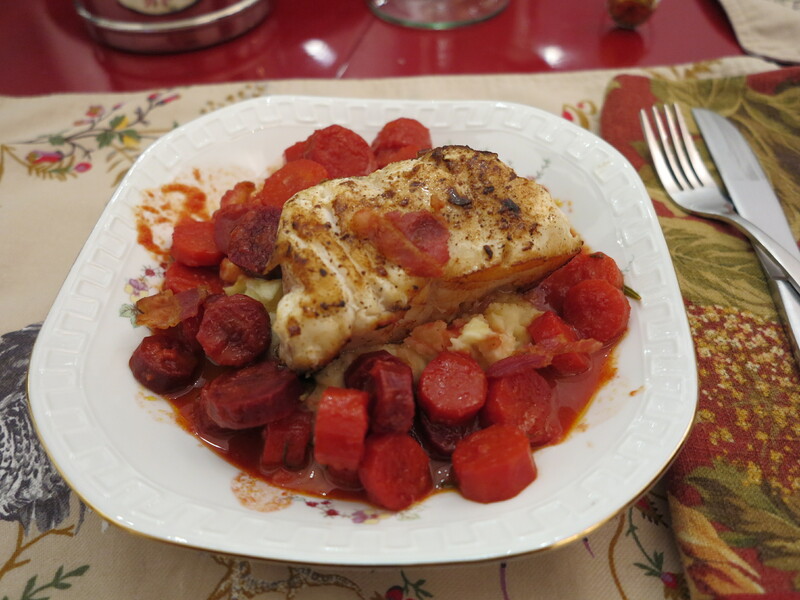 First up, last week’s French Fridays with Dorie recipe, Monkfish and Double Carrots. Many of my fellow Doristas had trouble finding monkfish. Not me. Monkfish, or Seeteufel in German (literally translated as “sea devil”), is quite popular around these parts and shows up regularly on restaurant menus. Sure enough, my fishmonger didn’t bat an eye when I asked for it and sliced me off two generous portions for our dinner. The double carrots on the other hand, not so easy. It’s plain carrot juice which is difficult to find here in Frankfurt and I knew this from experience. Sure enough, I found carrot juice mixed with various other juices to sweeten it up, but no plain carrot and finally settled for carrot-orange juice. In fact, if anyone knows of an easy way to make carrot juice without a juicer, do let me know. Because I have the feeling that I would have preferred this without the extra sweetness from the orange juice. The fish, however, cooked in bacon no less (!) was delicious. Which brings us to this week’s recipe, Roasted Jerusalem Artichokes with Garlic. I was happy to find these funny looking veggies at Kleinmarkthalle, a wonderful covered market hall in the center of Frankfurt. This was a fun one because I’d never cooked with jerusalem artichokes before. To be honest, I’m not ever sure if I’ve ever eaten a jerusalem artichoke before. Either way, thank you, Dorie for introducing me to this delicious vegetable and a fabulously simple recipe for preparing it. 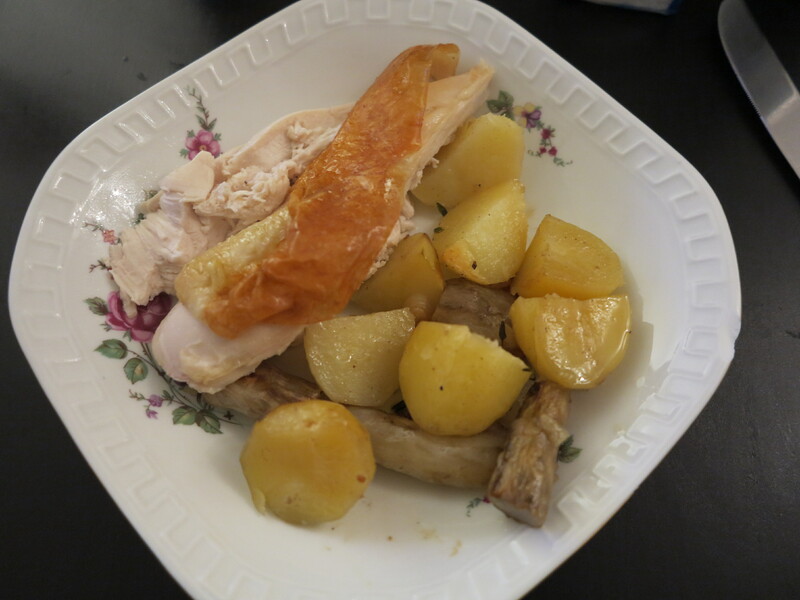 I turned it into a one pot meal by throwing the garlic and jerusalem artichokes into a pot with a few potatoes and a lazy chicken. Oh that lazy chicken, still a favorite. And this jerusalem artichoke recipe is a new favorite. I may need to stock up on more before the season is over. This entry was posted in french fridays with dorie and tagged Around my French Table, fish, main course, seasonal - autumn, side dish, vegetarian. Bookmark the permalink. Yeah, sourcing plain carrot juice was a chore here, too…I finally found some with some lemon juice added. No monkfish, though. I like the idea of adding potatoes to the Jerusalem artichokes…it looks like a tasty combination! I”m guessing the yellower chunks are the Jerusalem artichokes. One they are cut, they blend very well with the potatoes. Sounds like a terrific combination with the lazy chicken’s drippings. It’s always fun finding a new vegetable to love and look forward to. The paler yellowish pieces are the potato and the darker slenderer pieces are the jerusalem artichokes. They darkened up more than the potatoes in the pot and in the picture get a bit overwhelmed by the potatoes. Very tasty combo. Mixing potatoes with the sunchokes is a great idea! They paired really well! I will do it again. Lucky you to get monkfish and Jerusalem artichokes! Glad you liked both dishes. Thank you for posting these two difficult to get ingredients in one great post! I too had difficulty sourcing plain old carrot juice! Rosa, Your JA look so different than mine looked. Mine were quite knobby and fat…yours look long and slender. Either way we both agree, they were good! Your monkfish looks marvelous! You do need a blender, but it looks pretty easy! Happy Friday! Ooooh, adding to the lazy chicken pot (one of my favorite FFWD recipes ever) sounds great! And I love the German name for monkfish. Sea devil 🙂 I think if I’d found Jerusalem artichokes that were straight like yours (mine had all kinds of weird knobs) I wouldn’t have minded peeling them. They did taste delicious! I like the idea of adding them to that chicken recipe (I think that lazy man’s chicken recipe is my most cooked FFwD recipe to date – I think we make it almost once a month for Sunday dinner). 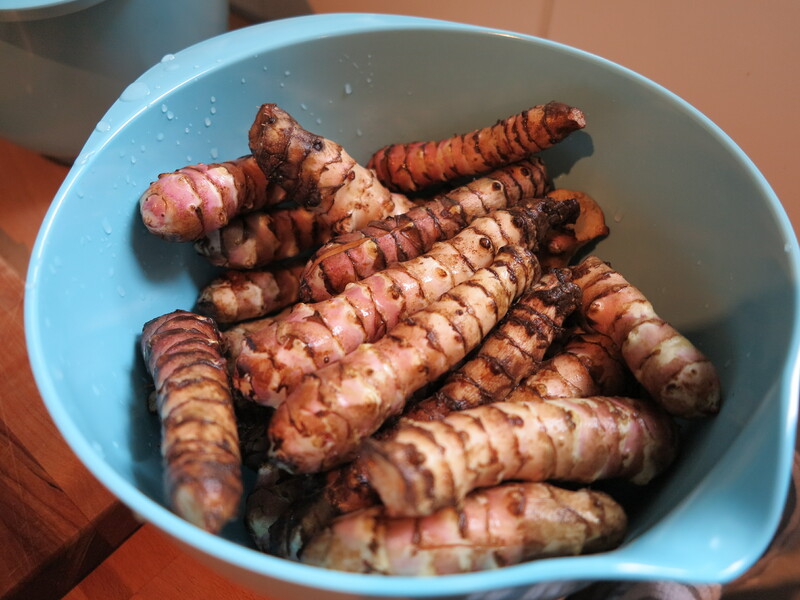 I am jealous that your sunchokes were so straight – ours were very knobby and a cleaning challenge for sure! Such a good idea to combine this with the lazy chicken! That’s one of my favourites, too. Your sunchokes are so different from ours – I noticed this with Andrea’s post, as well. They look easier to clean, for one thing. And sea devil is an apt moniker for monkfish. They’re not pretty. Rose, how nice that you enjoyed both the “Seeteufel” and the “Topinambur” – they are indeed easy ingredienst to find around here – as far as the plain carrot juice is concerned, you should try a “Bioladen” or a “Reformhaus”….they carry plan carrot juice. And you are so right about the beautiful weather – let´s enjoy the day today, as it seems to be one of the last wonderful days in October! Both your dishes look great Rose!